Hunger cravings inspired this meal and some surprising self-control on my part allowed me to hold off on eating long enough to get the pictures to post it here. That, in and of itself, is a miracle. For those that don’t know me, when I get hungry my Mrs. Hyde comes out. It’s not pretty. The impetus for this recipe started with a run this morning. I love my daily run, but struggle a bit in the summer. The heat and humidity slow my step and derail my good intentions. It’s happened more than once this summer that my run, not far from my front door, has slowed to what most would consider a leisurely walk. However, this morning I made it out the door, up the street, and through all five miles of my run. I arrived home hot and hungry to an empty fridge. Red-faced and sweaty, I wanted something cold, salty, and packed with carbohydrates. My stomach growling was just one warning that things could go downhill quickly. 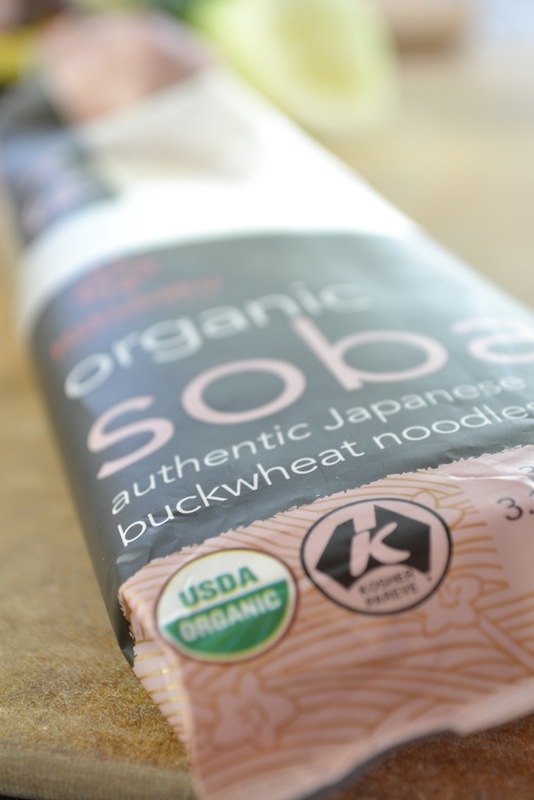 Luckily, in ravaging the pantry for food, I came across a package of soba noodles. 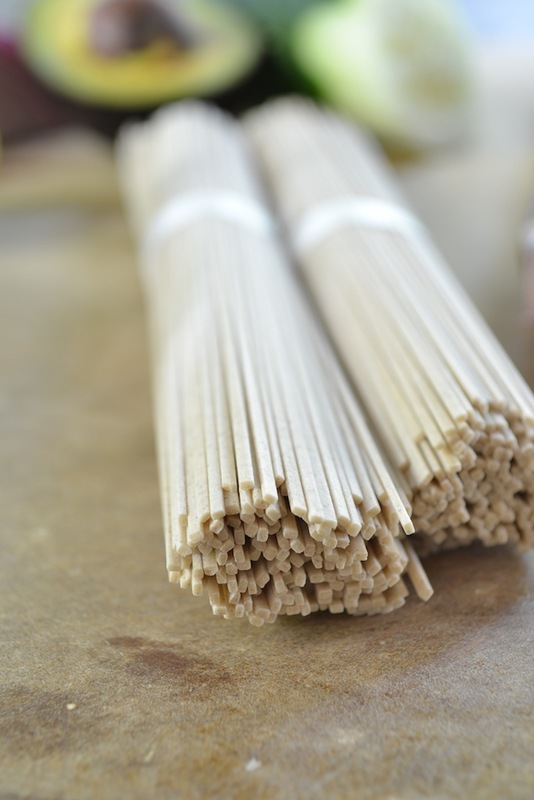 Japanese soba noodles are made from buckwheat, cook quickly, and – this is what made me commit – can be served cold. 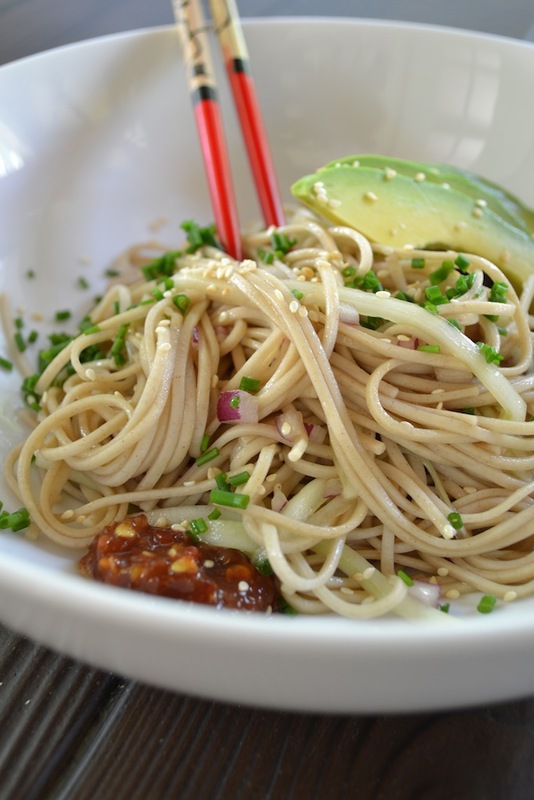 I googled cold soba noodles and came across this yummy-looking recipe from Love and Lemons. 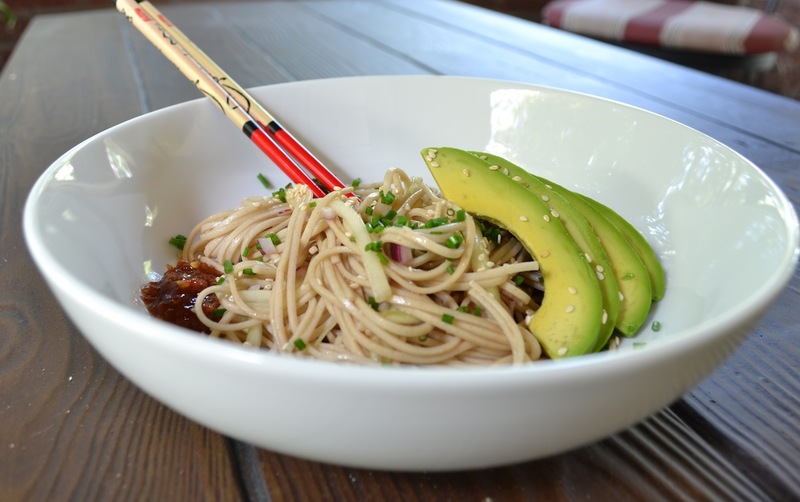 I adapted the recipe to what I had on hand and in 15 minutes (including time for photos) I was chowing down on a cold and refreshing bowl of soba noodles with cucumber, red onion, and avocado. Not too filling (or at least the first serving wasn’t), this delicately flavored recipe is a keeper and might just be the incentive I need to get myself through my summer runs. Happy cooking. The recipe for Cold Cucumber Soba on the blog LOVE & LEMONS (www.loveandlemons.com) inspired this refreshing dish. Feel free to make your own version based on what you have on hand. The decision to use minced red onion instead of sliced green onions was based solely on the contents of my refrigerator. Bring a medium saucepan of generously salted water to a boil. Add the soba noodles and cook according to package directions (about 4 minutes). Drain the noodles and rinse under cold water until cool. Drain and place in a large bowl. 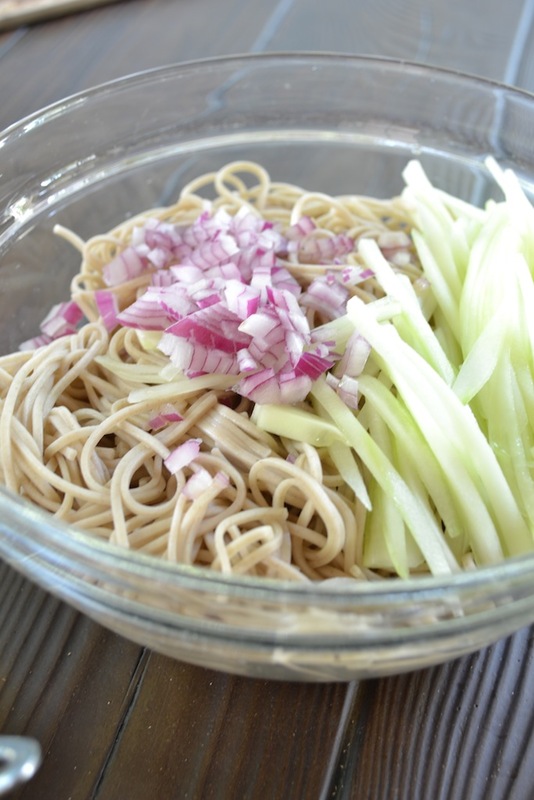 Add the julienned cucumber and red onion to the noodles and toss to combine. 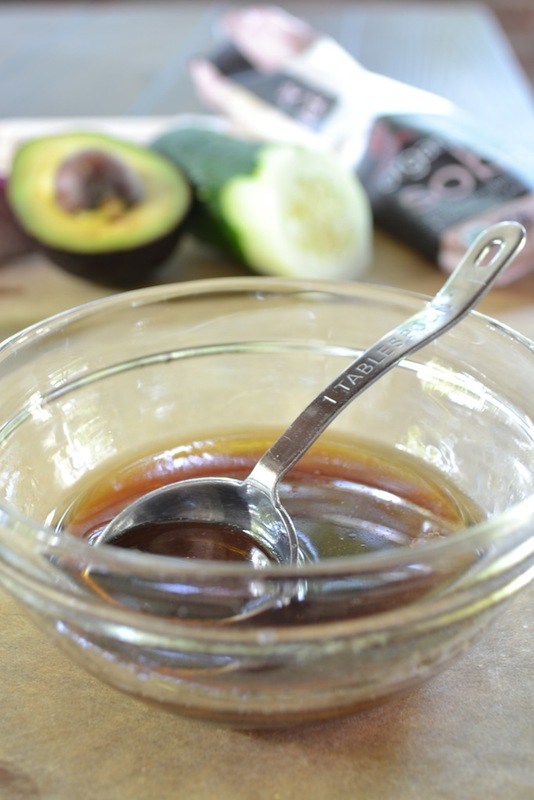 In a small bowl, whisk together the sesame oil, rice vinegar, soy sauce, lime juice, and brown sugar. Drizzle over the noodles and vegetables and toss to combine. Adjust seasoning as needed. Refrigerate the noodles until ready to serve. Heat a small skillet over medium heat. Add the sesame seeds and cook, shaking often, until golden brown. Remove the toasted sesame seeds from the heat and set aside. 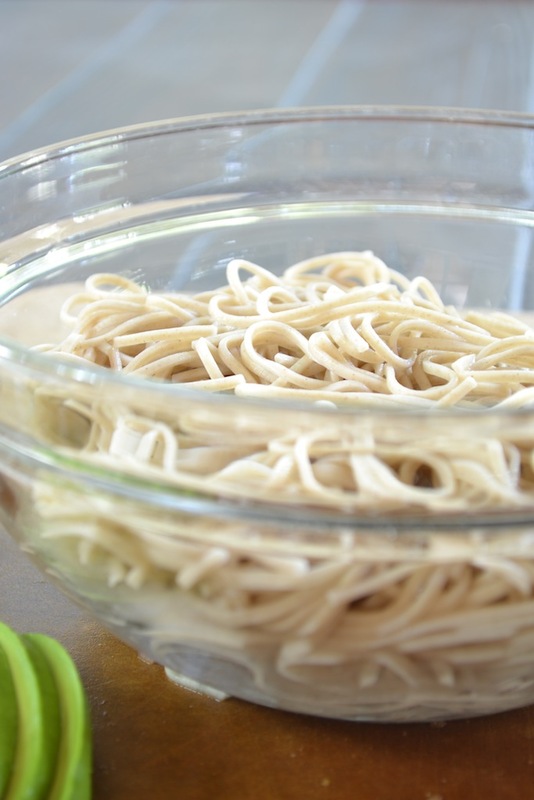 Divide the cold soba noodles between two shallow bowls. Sprinkle the toasted sesame seeds and minced chives over the top. 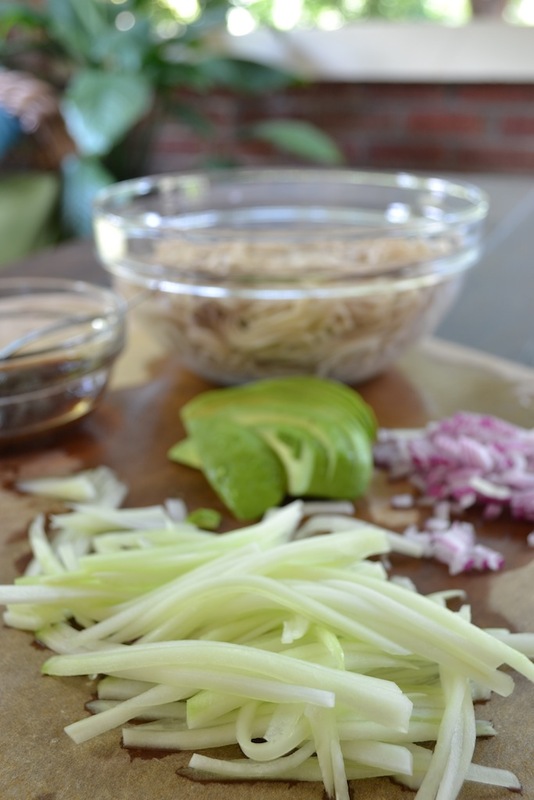 Garnish each serving with a couple of avocado slices and a dollop of sambal oelek if you prefer your noodles spicy. Serve. Thanks, peter! I had leftovers today and it was even better. Like most things it benefits from a little time to allow the flavors to meld. Regardless of how long you wait to eat it, it is a delicious summer dish. Well certainly make extra! It makes delicious leftovers.